Members of Marine Aerial Refueler Transport Squadron 152, rescued two downed helicopter pilots on Nov. 24, during Operation Damayan in the Philippines. From left to right: Master Sgt. James Holdaway, Lance Cpl. Daniel Lopez, Sgt. Chris Weins, Sgt. Jason Differ, Cpl. Christopher Oliver, Capt. Christopher Kim and Maj. Jason Kauffman. 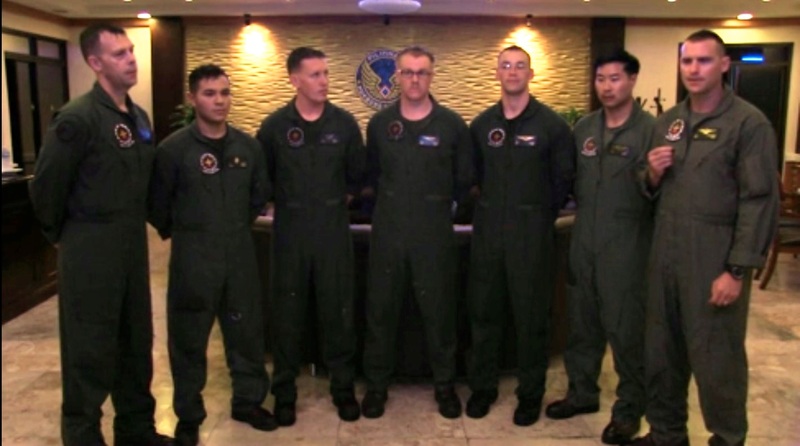 Seven Marines aboard a KC-130J Hercules rescued two pilots after their helicopter lost power and crashed into Manila Bay while they were assisting with relief efforts following last month’s typhoon in the Philippines. Maj. Jason Kauffman, a pilot with Marine Aerial Refueler Transport Squadron 152, said the Marines were conducting aerial logistics support on Nov. 24, between Tacloban, Manila and former Clark Air Base, the three hubs the Corps set up during Operation Damayan. They were also transporting three members of Congress who traveled to the Philippines to observe the relief efforts: Reps. Trent Franks, R-Ariz.; Chris Smith, R-N.J.; and Al Green, D-Texas. As they were preparing to land in Manila, they heard a mayday call from two pilots transporting relief supplies. One was American, the other German. “They were still airborne at the time, but said they were ‘going down’ 16 miles northwest of Manila,” Kauffman said. But the situation got more complicated when the rest of their transmission was interrupted by another aircraft using the same frequency. Pilots are supposed to stop communications over the frequency when a mayday call is heard, but they either disregarded it or didn’t hear it, Kauffman said. So the pilots’ exact position wasn’t clear. An Australian C-130 was in the area, Kauffman said, and he began communicating with that pilot who heard the full transmission. The Marines asked to cancel their approach in order to assist with the downed helo, Kauffman said, and one of the stranded pilots responded directly. Still operating without much information, Kauffman and his crew headed towards their location. They descended to 1,500 feet and got back in touch with the Australian pilot, who was at 300 feet. The Australian pilot helped to guide them to the downed pilots’ location. Kauffman told the Australian pilot they had a raft they could push out to the pilots in the water. They were also ready to assume “on-scene commander” duties, so the Australian pilot climbed in altitude so the Marines could get lower. The Marines got down to 300 feet and Kauffman slowed the aircraft speed to search for the crew. The Australian pilot remained overhead to assist with radio calls, and one of the pilots in the water had an emergency radio he was using to communicate, Kauffman said. The bay was also a bit choppy that day, making it difficult to see two people treading in the water from 300 feet in the air. Kauffman said it wasn’t for the emergency radio, the Marines might not have ever found the pilots. The entire crew, including the congressmen began scanning the water for a sign of the pilots, he said. Once they spotted them, they marked their position and refined their orbit pattern, he said. The descended to 200 feet and crew in the back of the aircraft began preparing to kick the raft out. The downed pilot with the radio was calling for them to immediately “drop, drop, drop,” Kauffman said. But they still couldn’t see them clearly enough. Kauffman said he didn’t want to drop the large raft on top of them from 200 feet, risking their injury or death. So they asked him to again call out turns for another pass, and that one proved successful. They stayed in the area for about an hour and requested that Manila Ground Control contact the Philippine Coast Guard. They asked repeatedly that the coast guard provide an expected arrival time so they could get the pilots out of the water, but the information never came, Kauffman said. So they flew low over several fishing boats, flashing their lights in hope they would respond. Eventually a fishing boat headed in the direction of the downed pilots and pulled them aboard. Kauffman and his co-pilot, Capt. Chris Kim, were able to speak to them a few hours later. He said the pilot must have executed a textbook auto-rotation emergency landing in order to have touched down onto the water gently enough to prevent injuries. Kauffman credits his crew’s training for their quick and professional response. Every aviator should be prepared to assist other airmen in distress, he said, and they make a checklist before every mission to make sure they’re ready for that type of emergency. The rescue also reaffirmed his faith, he said. That’s my Sumos! Flying with that squadron was the highlight of my service. way to go SUMOS ooorah!